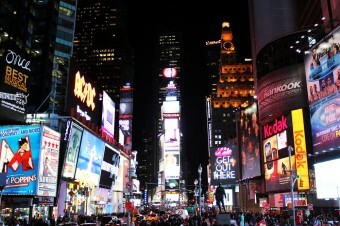 Jeremy asks: Why do we drop the ball on New Year’s eve in Times Square? When Adolph Ochs purchased the floundering New York Times in 1896, he made it his mission to make the newspaper the number one paper in all of New York. He started by forming the New York Times Company and made himself the majority owner, ensuring the financial health of the paper. Next, he lowered the price of a daily edition from three cents to one cent. Readership began to ascend. Then, he moved the entire staff into a new shiny building in the middle of Manhattan, to a place called Longacre Square, later renamed Times Square. But Ochs was a man of fine tastes and big imagination. To celebrate the 1904 New Year and to show off the Times’ new digs, Ochs threw a lavish New Year’s celebration that was to be “the talk of the town.” He hosted an all-day street festival climaxing with a midnight fireworks display from the base of the Times building. Reportedly at midnight “the joyful sound of cheering, rattles and noisemakers from the over 200,000 attendees could be heard from as far away as Croton-on-Hudson, thirty miles north.” Despite the city later putting a kibosh on the fireworks display, the Times Square New Year’s Eve bash was born. Even without fireworks, Ochs found a new way New Yorkers could celebrate the incoming new year in style and with glorious light. In 1907, Ochs commissioned the building of an electrically-lit ball to be lowered on the flagpole of the roof of One Times Square (the new name of the newspaper’s building). 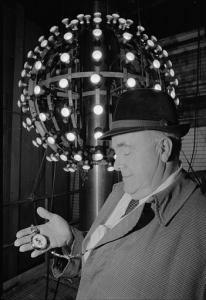 A “time ball” had been the suggestion of the newspaper’s head electrician, Walter Painer, who had seen one in use on top of the close-by Western Union building. Time balls had been a favored way of broadcasting the time to sea travelers in the 19th century. The first one was built in 1829 by inventor Robert Wauchope. These soon became regular features in ports across the world. When the ball began its descent (1 pm in many parts of the world and noon in the US), people would set their clocks to match the ball. By the beginning of the 20th century, with the advent of radio and other more advanced technologies, the time ball became obsolete. In 1907, the time ball, while not completely considered archaic yet, was beginning to become something people just enjoyed watching. Incandescent light bulbs were a relatively new invention, having just begun being mass-marketed to consumers around the turn of the twentieth century. The newness of this innovation appealed to Adolph Ochs and he fashioned his “New Year’s Eve Ball” with one hundred 25 watt light bulbs. The rest of the ball was made out of iron and wood. Though it was only five feet in diameter, it weighed nearly 700 pounds. Ochs had a young immigrant metalworker by the name of Jacob Starr, working for the sign company Artkraft Strauss, make the ball. Starr was also given the responsibility of lowering it at the specified time. On New Year’s Eve, 1907, at exactly the stroke of midnight, Starr lowered the ball signifying that it was 1908 and the beginning of a New Year’s tradition. The ball’s construction over time, in many ways, mimicked the history of industry in the United States. In 1920, they would replace the original ball with one made solely out of iron, showing off the steel strength of America. The ball didn’t drop in 1942 and 1943 -the only time it didn’t drop in the last 110 years- due to wartime light restrictions and industrial production focused on the war efforts. In 1955, the heavy iron ball was replaced by a much lighter aluminum ball weighing in at a shade over two hundred pounds. Rhinestones, strobe lights, and a computerized lighting system were added in 1995, signifying the age of ubiquitous computers. The new millennium brought a new ball outfitted with 504 Waterford Crystals, 168 halogen bulbs, and spinning mirrors. The weight of the ball jumped from two hundred pounds to over 1,070 pounds. Today, the ball is twelve feet in diameter, more than double its original 1907 size. The new ball weighs in at over five metric tons and features LEDs and computerized lighting patterns. It sits on top of One Times Square year-round for tourists and locals alike to marvel at, but it’s only on one day a year the we actually see the ball drop. After his raucous New Year’s celebration in the square, Adolph Ochs petitioned the city to build a subway station to shuttle his employees right to the front steps of the Times building. 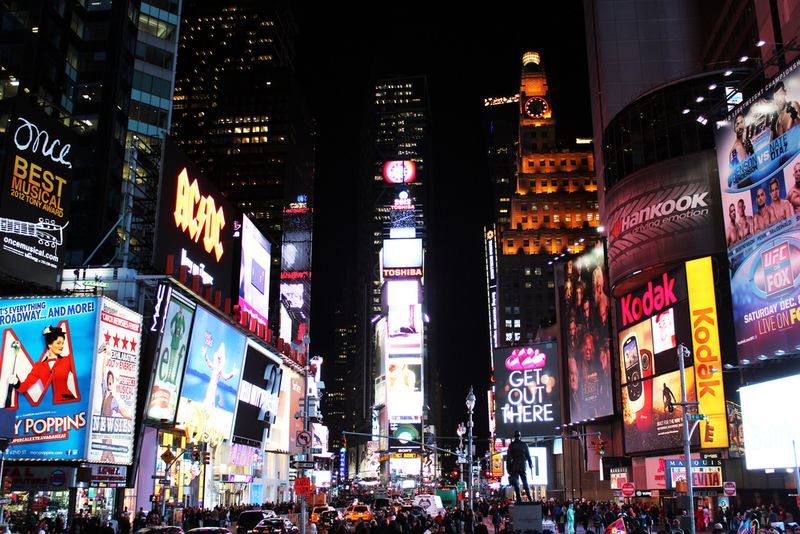 They agreed and on April 8th, 1904, Mayor George B. McClellan Jr. officially renamed Longacre Square to Times Square, in honor of the very influential newspaper. New Year’s Eve 1907 was a huge affair and unlike any party the city had ever seen. In addition to a giant electrified lighted ball dropping on top of the Times Square building, waiters in Times Square’s “lobster palaces” (huge restaurants with large portions – think Cheesecake Factory today) were given battery powered top hats that had the numbers “1908” written in tiny light bulbs. When the clock hit midnight and the ball began its descent, the waiters “flipped their lids’ and 1908 lit up on top of their hats. Adolph Ochs fashioned the New York Times into a stoutly anti-Democratic publication. When William Jennings Bryan ran for President three times (1896, 1900, 1908), the Times opposed him all three times. Bryan was a fierce opponent to the theory of evolution (evidenced by him acting as the prosecuting council in the Scopes Monkey Trial) , as well as a proponent of Prohibition. In addition, Ochs himself was an early board member of the Anti-Defamation League and engaged in a years-long campaign against anti-semitism. He used his influence to call out and shame newspapers for caricaturing and encouraging unfair stereotypes against Jews in the American press. 1) Ochs bought the Times in 1896, not 1898. 2) It was spelled Long Acre Square. 3) Ochs did not turn the Times into a “stoutly Democratic organ,” as witness by the fact that, as the article says, the paper opposed Wm. Jennings Bryan all three times he ran for president. Bryan was a Democrat. @EJ: 1) Yep, thanks for catching that! 🙂 2) Probably just depends on who was writing it and what year, but all the sources I’m seeing say “Longacre”, such as this one. 3) Correct again. Fixed! It is not ‘New Years’, it is ‘New Year’s Eve, with an apostrophe after the ‘r’. It is difficult enough when teaching English to students as a second language, without having to explain why people who speak English as a first language are partially illiterate. @Jonde: Perhaps you’d have better results with your students if you tried a less abrasive approach. For instance, when someone makes a typo, instead of calling them “partially illiterate,” simply politely point out the mistake. Whether the root cause was ignorance of some grammatical precept or just an unintentional typo, they are likely to be more receptive to whatever you’re trying to teach. They will also respect you more, which will aid in teaching them things in the future. One might argue civility is perhaps a more important virtue than grammatical perfection, the latter of which being an impossibility given a large enough sample size. Daven, Great article I found it very interesting and informative. Why is it that so many of the comments left on online articles have to do with spelling or grammatical mistakes. Why can’t people just enjoy the article? I usually don’t leave comments on articles because I am too lazy. However I had to comment here. When a date is wrong and someone leaves a comment and corrects it, great. Collaboration is what the internet is for. But WHO CARES about simple grammatical errors or typos. Give a guy a break! You are doing an excellent job. Keep up the great work, the thousands of people like me who read your article but don’t leave a comment really appreciate the hard work you put in to researching and writing this article. Thanks again! ps. I am sure my post is full of spelling mistakes and grammatical errors. please enjoy spending your time correcting it. The terminology used by many people today, especially the younger generation, when they are discussing the last day of the year, the comment is, “New Years”. To my eyes and ears I am waiting for the continuation of new years, and mentally wonder what comes after, new years, and yes, in the correct context there will be many new years, or new year’s fashion, or car, or book. My comment was made, not to relate to you Daven, but when I see some of the comments in social media it is astounding that so many comments don’t make sense. The article in question would have been found by you in researching the thousands of articles to add to this site, and as in newspapers, and general media when the journalists and commentators should know better, and return to speaking a writing correct English. Partial illiteracy is commonplace in Australia, and is not a good indication of today’s teaching methods when the children are number twenty on the list in the world of English literacy. There is nothing wrong with a little abrasion, as in past years of teaching because today’s political correctness and soft approach is not working. I don’t see many young people today who can write legibly, hold a pen correctly or perform simple arithmetic calculations. A hot day or a hot price, I can be cool on a chilly night, is that cool. The Italian and Indonesian languages are simple and straightforward to learn, thank goodness. Daven, I have found this and all of your articles very informative & well written. Thanks for your meticulous efforts in researching the information. Keep up the good work, and I will keep on reading through 2015! You have inspired this my first response to an online article and I say “The naysayers be damned” (Tongue-in-cheek). As a professional writer myself, I note typos out of respect for the author, not to denigrate them. It helps make a strong piece better. I make comments just for the heck of it. To wit: I have never understood why they drop the ball instead of raise the ball. People can see it if it’s up in the air. Put a little bell when it reaches the top and, hey hey, it’s the new year. Even with this nifty explanation, I think the ball should go up. It just makes more sense. Time balls used for setting chronometers were raised shortly before the time to be set, and dropped quickly to indicate the set time. This was the same procedure used for signal flags at sea. It makes plenty of sense to those familiar with either time balls or signal flags. If we were starting today I’d agree with Rob. Start with the ball down, light it partially as it starts up at 23:59:00 and change to full brightness as it reaches the top at 00:00:00 on the first day of the new year. But we have decades of custom to overcome and I don’t see it happening.